The Uneven Nine Patch style of quilt block is so named because not all of the nine individual patches are the same size as is the case in a regular nine patch quilt block. This style of quilt block is often used in 10" quilt block to make the math easier, but you will find this construction method in many other quilt blocks as well. With a name like Baton Rouge Square, well I just had to throw some red into the block. In fact, I made it the background colour. 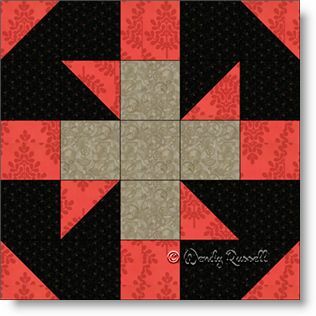 This nine patch quilt block is a simple one to make as it contains only half square triangles and squares. It is also a nice deviation from the regular 12" blocks that are so frequently seen. Many quilters like the math in the 10" type of quilt blocks. In the illustrations of sample quilts that can be created, you can see that by simply switching the placement of two of the fabrics, you can achieve a very different quilt. I hope you enjoy the process of making your own Baton Rouge Square quilt.